The missing elephant-in-the-room headline here is: “The Lost Decade.” The graph makes clear that lack of long term progress in public awareness of climate change (comparing 2018 and 2008) cannot be blamed on the Trump Administration and its world-historic denial of basic science. Ten years is a very long time to being going at close to ‘business-as-usual’ full speed in using up the carbon budget required to avert much worse climate change than is already in the future pipeline. Speaking of the future, it is difficult to conceive of generations to come looking back at this lost decade without invoking characterizations of shameful dereliction. 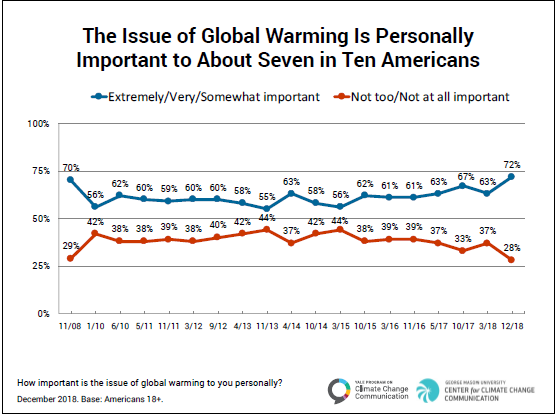 I am not convinced that asking about acceptance of climate science and how “personally important” anthropogenic global climate change is, but without querying views on policy options, is necessarily a positive feature of this latest public opinion report. Other countries with stronger and less wavering percentages of the populace accepting the reality and significance of global warming, nonetheless do not have markedly better track records than the USA when it comes to actual emissions reductions. 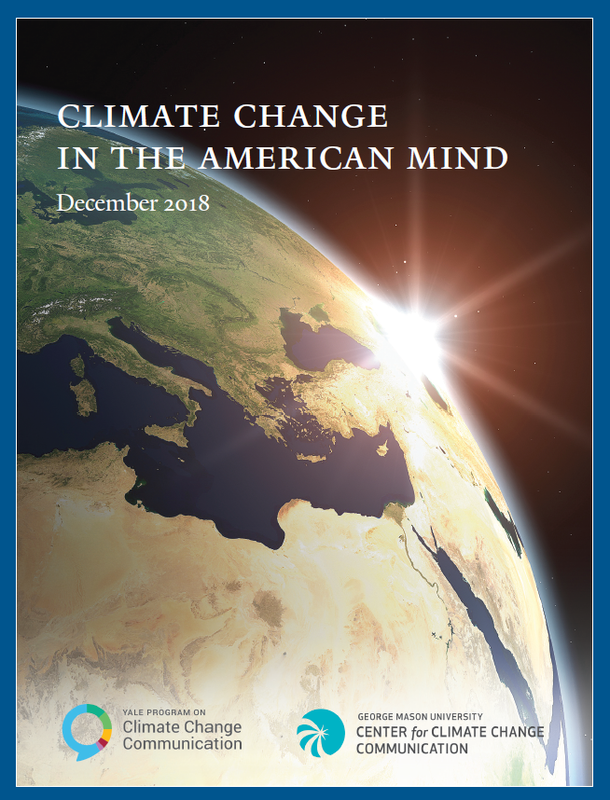 Better data on how Americans view measures (carbon taxes, green new deals, or other steps) capable of achieving bonafide substantive reductions in carbon usage, would provide a better indication of voter willingness to actually tackle climate challenges, and not merely settle for tokenist gloss on generational failure. How carbon taxation might be meshed with a “Green New Deal,” strikes me as mainly a tactical question, not easily answered in advance of tangible attempts at national legislation, but I see no a priori reason while both approaches could not be vigorously pursued and effectively implemented, simultaneously and in tandem (as suggested in last week’s CTC report concerning Representative Ocasio-Cortez’s advocacy of both “polluter pays externality pricing” and a green new deal). “It’s not about the climate; it never was.” Here, I would like to start with that statement. In this brief article, I will discuss why carbon dioxide isn’t the dangerous gas it is made out to be, why climate change is not an ‘existential’ threat to the planet, and why the Green New Deal is not a solution to climate change. Is our climate changing? The answer is clearly “YES” because climate has always changed. We often define ‘climate’ as ‘average weather’ and averages are not supposed to change. If they do, the cause must be unnatural. Treating the climate as a statistical average further implies that it should be static; in fact, the Earth’s climate is dynamic, variable, and ever-changing. Is global warming real; or, more specifically, has the surface air temperature risen about 0.6°C (1.08°F) since the late 1800s? The answer also is “YES,” and on that there is little debate. Do humans affect the Earth’s climate?Again, the answer is “YES” with little debate. We can point to the urban heat island—for example, the Washington metropolitan area is warmer than the surrounding countryside due to the urban city and this has been widely studied. Because of impervious surfaces and the increased water demand of urbanized areas, floods and drought frequencies and intensities also are affected. Does carbon dioxide absorb energy? Yes, certainly. The Earth’s surface is warmer than it would be in the absence of an atmosphere—by about 30°C (54°F). But remember, the most important greenhouse gas is not carbon dioxide; it is water vapor. Water cycles fast through the atmosphere, absorbing energy as it evaporates and releasing that energy as it condenses. The current amount of water in the global atmosphere will fall as precipitation in just the next ten days. Its mobility and efficiency in absorbing heat energy makes water fundamental in explaining the climate of the Earth. If the amount of carbon dioxide in the atmosphere doubles, what will the effect be on global air temperature?This is where the debate begins. We seek to determine something called the equilibrium climate sensitivity—that is, the eventual rise in air temperature due to a doubling of carbon dioxide. Over the last twenty years, our estimates of the equilibrium climate sensitivity have decreased substantially, based on measurements of the climate system. In the early 2000s, estimates were that a doubling of carbon dioxide would result in between a 3 and 6°C (5.4 and 10.8°F) warming. Since 2010, however, most estimates have placed the equilibrium climate sensitivity at less than 3°C (5.4°F), and over the last five years, several independent assessments have placed the sensitivity at about 1°C (1.8°F). This implies that the effect of a doubling of carbon dioxide has much less impact than the models suggest—their sensitivity has remained above 3°C (5.4°F) over the last two decades—which helps to explain why their estimates of warming are much higher. How do we know that carbon dioxide is a minor player in climate change? Both theory and models tell us that the biggest effect of carbon dioxide on air temperatures should lie in the upper tropical troposphere. The troposphere is the layer of the atmosphere where all weather resides. Over the last forty years, the warming of this layer has been small, whereas the models indicate the warming should have been much greater. This further underscores that climate models grossly overstate the climate warming. Moreover, theory also indicates that daily maximum air temperatures should rise if carbon dioxide is the main driver of climate change. In fact, daily maxima have not changed substantially over the last eighty years, and before that, maximum air temperatures were much higher during the Dust Bowl of the 1930s. Minimum daily air temperatures have increased, but that is associated with the warming of urban areas. Averaging these two extremes to get a daily average and then reporting that “this year is the warmest in recorded history” is highly misleading since most stations have a short record length and the warming is not due to carbon dioxide. Will this warming necessarily lead to more climate extremes—floods, droughts, hurricanes, tornadoes, sea level rise, etc.? I can write in great detail showing the data and explaining why these events are not increasing in frequency or intensity and why, under a warmer world, the physics indicate that they should not. Changing land use and increased demand for water are more significant than carbon dioxide in changing the impact of climate on our lives. Coverage of extreme weather gives the false impression that violent weather is becoming more frequent and intense when the data say otherwise. Is a warmer climate and more carbon dioxide a net benefit to life on the planet?The answer to this question is a resounding “YES.” More people die from exposure to cold than heat. A longer growing season is more beneficial to feeding a growing population. Further, since carbon dioxide is plant food, under higher carbon dioxide concentrations, virtually all plants grow faster and are more efficient in using water. So, what is the climatic benefit of spending trillions of dollars and fundamentally changing our economy and way of life? The Green New Deal is not about ‘stabilizing’ the Earth’s climate. Carbon dioxide is a small player in climate change. The United Nations has become the modern-day Robin Hood—creating wealth redistribution on a global scale. Industrialization has made developed nations ‘rich’, and by using fossil fuels, they are supposedly destroying our climate, for which the developed world must pay. Rich nations, therefore, must give much of their wealth to the poorer nations. Climate change has become the cause célèbre to move nations to action. The Green New Deal is not about stopping climate change. Climate always changes and always will. The United States has cut back on greenhouse gas emissions by about 13% since 2005 to virtually no effect on the Earth’s climate. The net effect of reducing the United States’ carbon dioxide emissions by 80% by 2050 would be negligible. Even reduction by 100% would have little effect on the climate, but the policies proposed by the Green New Deal would make Karl Marx proud. But realize this; any draconian changes such as these would necessarily change our fundamental way of life. And that, not addressing the ills of climate change, is what the Green New Deal is all about. David R. Legates, Ph.D., is Professor of Geography and Climatology, former Director of the Center for Climatic Research, University of Delaware, and a Senior Fellow ofThe Cornwall Alliance for the Stewardship of Creation. That helps me understand exactly what hes talking about. I’m not very educated but I read alot to help me understand this is a good equal understanding. Of what global warming really is. And carbon dioxide Thank you!